The Remastered Aeron only improves upon the original Aeron’s enduring legacy. With new colors, improved tilt functions, and a woven pellicle fit for a king or queen, it’s hard not to get too passionate about my office chair. Sometimes, you just have to spend the money. I spent the time to carefully research and buy only the very best of each individual item I was carrying. The best towel. The best pen and notebook. The best headlamp. The best headphones. 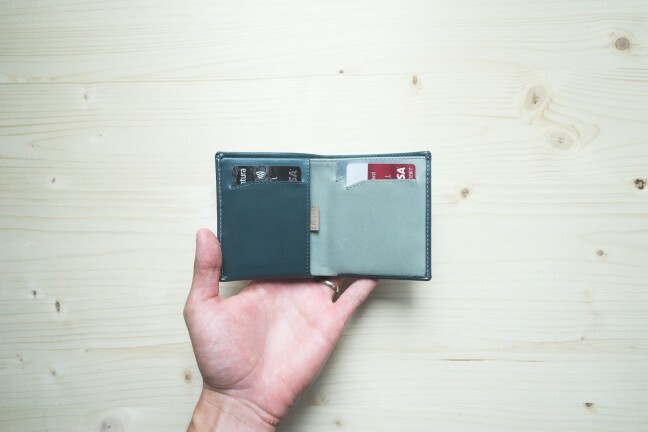 The best wallet. Everything I owned had been carefully designed by a person who cared deeply about the problem being solved… An interesting side effect, which I hadn’t anticipated, was that I developed a blind trust in the things I used… These might seem like stupid things to worry about, but when you have trust in everything you own, you don’t have to worry about anything. It’s liberating and an amazing feeling. 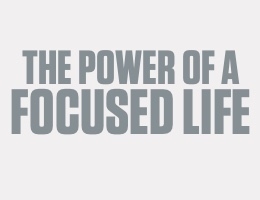 My life was markedly better because of it. Obviously, this habit can become insanely expensive and time-consuming. Want to buy the best wristwatch? No doubt, your research will lead you to a many-thousand dollar purchase. Same goes for pens, or bags, or wallets, or cutlery. I’m sure Curtis would readily admit that, under some circumstances, the research and money aren’t worth having the very best. But for items you use each and every day, Curtis’ thoughts are on the nose — spend dollars on things you use endlessly, and improve your life. And when it comes to office chairs, not only can you improve your life, you can also improve your health. You just have to spend the money. For many of us, eight to ten hour days in an office chair has become the norm. It doesn’t take rocket science to realize this is unhealthy — sitting is the new smoking. An obvious solution is to stand. Not a solution for everyone, but a solution with great results, nonetheless. A second solution is to continue sitting in your poorly designed, un-ergonomic chair and deal with the continuing back and thigh pain. Or, a third solution is to purchase the most renowned office chair in the world: the Herman Miller Aeron. The Remastered Herman Miller Aeron office chair, in its stunning new Mineral color. Back in 1994, Bill Stumpf and Don Chadwick envisioned a new type of office chair that featured engineering over design. The Herman Miller Aeron’s legacy extends all the way back to the early ’90s, when it became a status symbol in Silicon Valley. The two spent countless hours stressing over meticulous details, like the fall off of the seat under your legs to ensure proper blood flow through to your feet or the breathable membrane to ensure cool airflow to your back and legs. 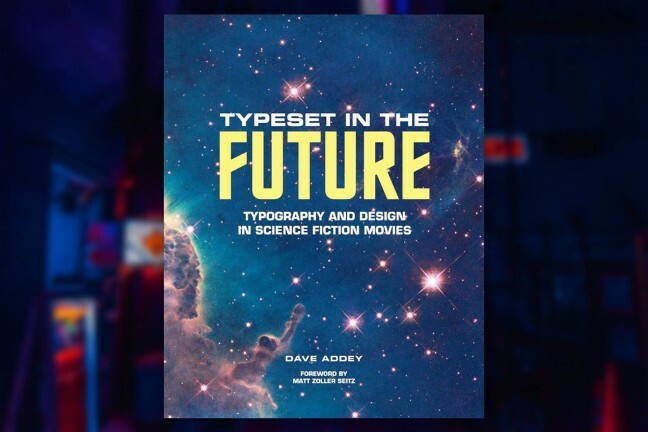 The meticulous attention to scientific details proved Stumpf and Chadwick were ahead of their time. 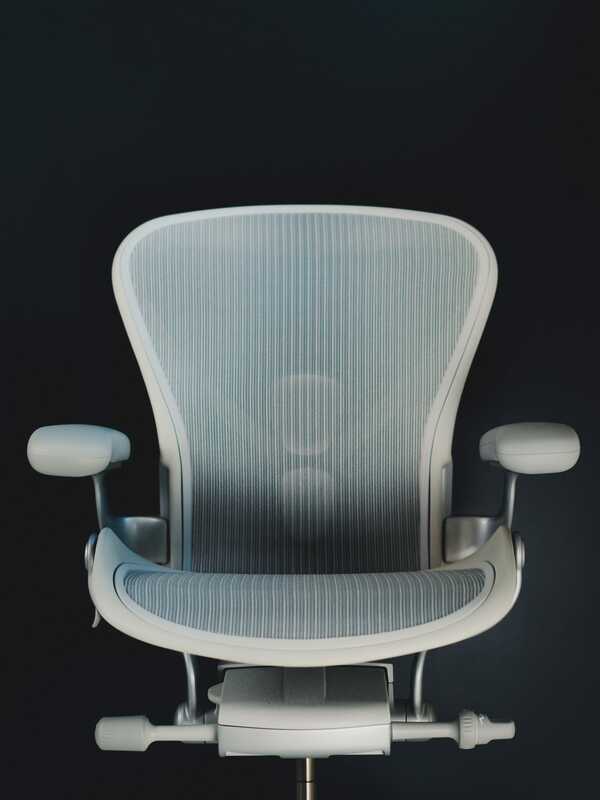 This is the first major redesign of the Herman Miller Aeron since it was originally launched in 1994. The interesting part: the Herman Miller Aeron didn’t receive a single update or redesign between 1994 and 2016. For many, the Aeron they purchased in 2010 to make it America’s best-selling chair was the same as those who purchased one back in 1994. And if you bought your Aeron back in 1994, chances are you hadn’t bought another one — not only have the chairs shown their durability, their potentially eye-brow raising cost would have anyone questioning whether a replacement was necessary. Along with new tilt functions and a plethora of other features, the new Mineral color fits well into any modern office. So, just last year, the Aeron underwent its first remastering since inception. With Bill Stumpf passing away in 2006, Herman Miller recruited Don Chadwick (the creator of the also widely popular Chadwick chair) to return to the original Aeron design and give it a kickstart with today’s modern materials. The Remastered Aeron has a new tilt function with a leaf spring — prior Aerons had a rubber coil spring. The renowned upholstery was replaced with a weaved membrane known as the “pellicle”. The original Aeron had better lumbar support than any other office chair at the time, so the Remastered Aeron doubled down on improved lumbar support. The Remastered Aeron comes with new customization options, a new Mineral color (as shown), and different sizes to accommodate more people. To say this redesign was a long time coming is an understatement, but the result is a chair I never want to leave and want to have in every office I find myself in. The Remastered Aeron (from here on, just “Aeron”) features the same Aeron design from 1994, but comes with a few new facelifts to give it a more modern appeal. First is the stunning Mineral color. The off-white color will fit in today’s growing number of modern offices and is sure to catch an eye — especially an eye from those who were aware most Aerons came in black/carbon colors for over 20 years. The Mineral color fits wonderfully next to a white desk or within a wood/concrete/glass setting. The Remastered Herman Miller Aeron in Mineral. Photo from Herman Miller. The Remastered Herman Miller Aeron in Carbon. Photo from Herman Miller. 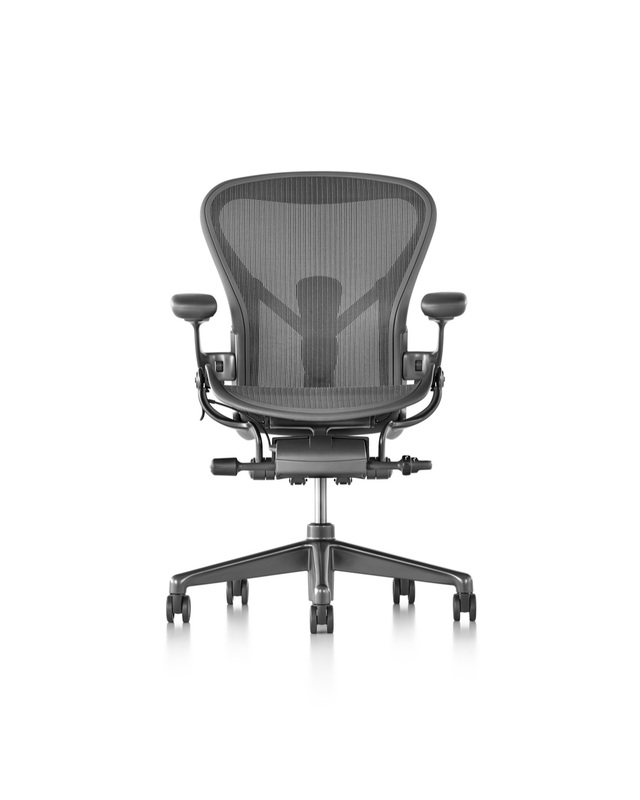 The Remastered Herman Miller Aeron in Graphite. Photo from Herman Miller. If the new Mineral color doesn’t fit your fancy, the Aeron still ships in a Carbon and Graphite color. These are far more ordinary colors in the Aeron world, but look great with glossy aluminum customization options. The “pellicle”, or the weaved membrane you physically sit on, is a major change over the original Aeron’s upholstered seating. The new membrane sports a tight weave that provides just the right amount of support and just the right amount of give. But, perhaps the larger upside of the new woven pellicle is its airflow — upholstered chairs allow next to no air to flow through to your back on a hot day. The woven membrane defies logic — you can clearly feel the support it provides, but you don’t feel any trapped heat. 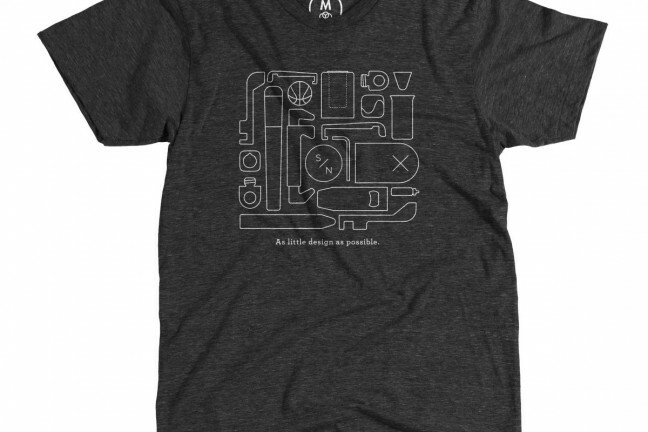 Air flows perfectly to keep your body cool and you focused on your work. 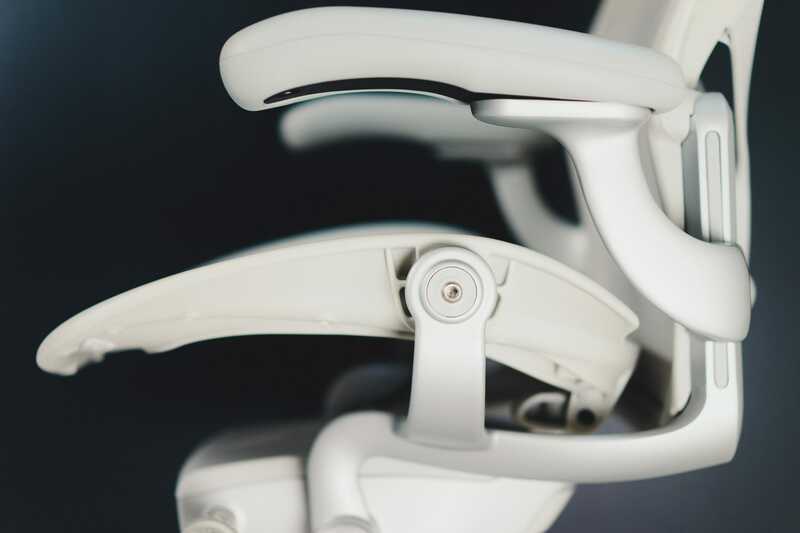 The top of the chair and the front-most part of the seat continue the contoured design from the original Aeron and work to provide your body with better blood flow and oxygen. The front of the seat falls down and away from your body, negating a 90 degree angle at your knee which inhibits blood flow and oxygen. Same goes for the contoured design at your shoulders — the chair flows out and away from your normal seated positioning, allowing you to keep your shoulders back and in a better posture. Lumbar support is the raison d’être of the Aeron, but oddly doesn’t ship with the baseline Aeron models. When you order you chair, be sure to check off the “PostureFit SL” box — it is fundamental to the Aeron’s design and support. Generally speaking, the slight S shape of the spine serves us well. “If you think about a heavy weight on a C or S, which is going to collapse more easily? The C,” Galen Cranz, a professor at the University of California. says. But when you sit, the lower lumbar curve collapses, turning the spine’s natural S-shape into a C, hampering the abdominal and back musculature that support the body. The body is left to slouch, and the lateral and oblique muscles grow weak and unable to support it. As such, the lumbar support mechanism helps maintain that “S” shape your spine has naturally developed. 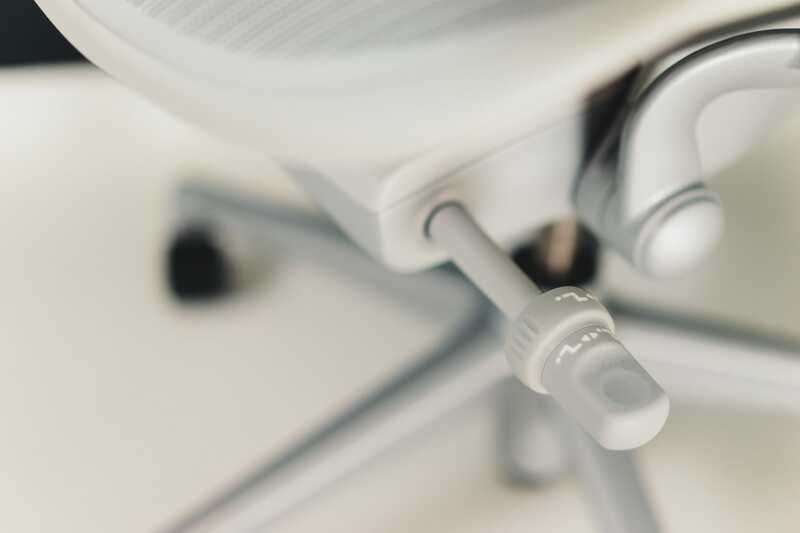 Spinning the chair around reveals the modernly designed lumbar support mechanism, which can be tightened or loosened to provide more or less support. Not only does the lumbar support mechanism feel great on your lower back, it also looks sleek from behind. The mechanism itself is made of hard plastic and high density, soft foam for proper comfort on your back. This is the only spot where a material other than the cool woven membrane touches your back, so it can tend to get somewhat warmer from time to time. By no means is it unbearable — truthfully, it’s barely noticeable. The Remastered Aeron ships in three different sizes for all types of people. 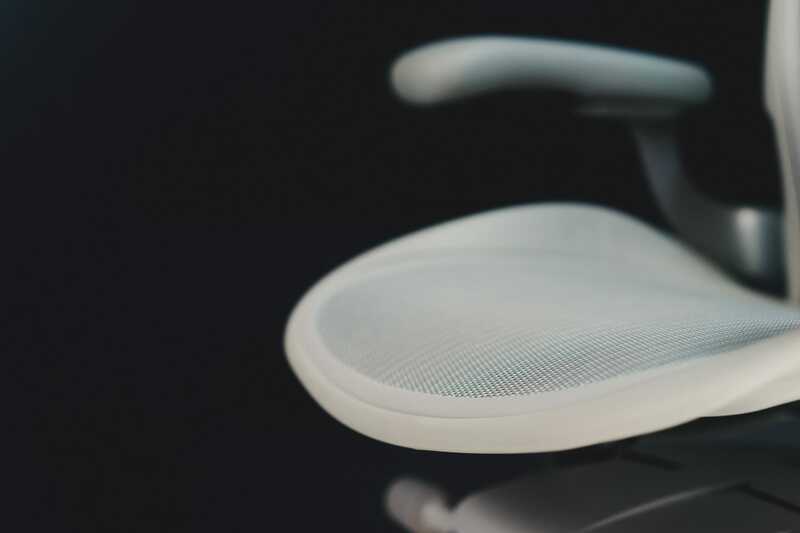 Herman Miller greatly boasts about the Aeron’s new inclusive design. Whether you have a larger body frame or a smaller body frame, there is an Aeron with your name on it. Pictured is a medium-sized chair, exactly the size of chair the salesman said would fit a 6-foot tall, lanky built man. If you’re not sure where you would fit on the Aeron sizing chart, head to their site to see the recommended sizes. The vinyl armpads cover high density foam and extremely comfortable for resting your arms during time of thought or conversation. I’m sure the vinyl will rip someday, but that day seems a long way away. The Aeron’s armrests are a heavy area of customization, so your option may differ from mine. The arms on this specific Aeron are made of vinyl and a high density foam. These arms don’t swivel right or left or push in forward or back — probably my biggest regret. You can purchase an Aeron with no arms, stationary arms, or fully adjustable arms. 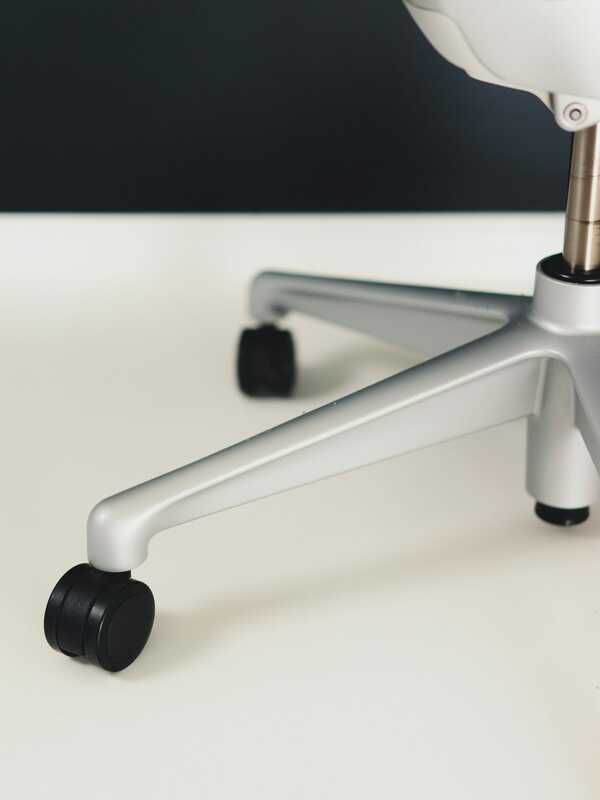 For the added money, I believe fully adjustable arms are a good choice — not only can you fine-tune your Aeron more specifically to your desk, you can fine-tune the chair more to your specific body. 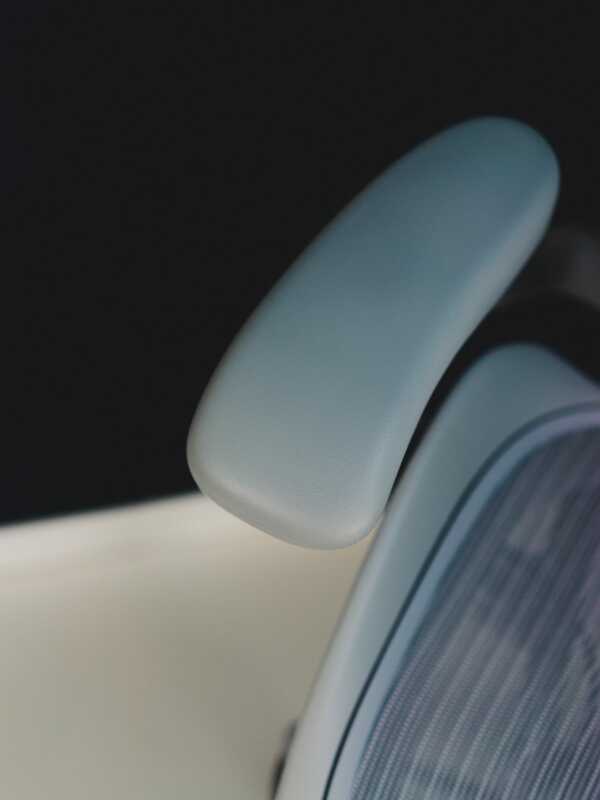 Whatever you decide, the armrests provide good support, durable foam, and an exterior synthetic vinyl that feels impossible to tear at this point in time. 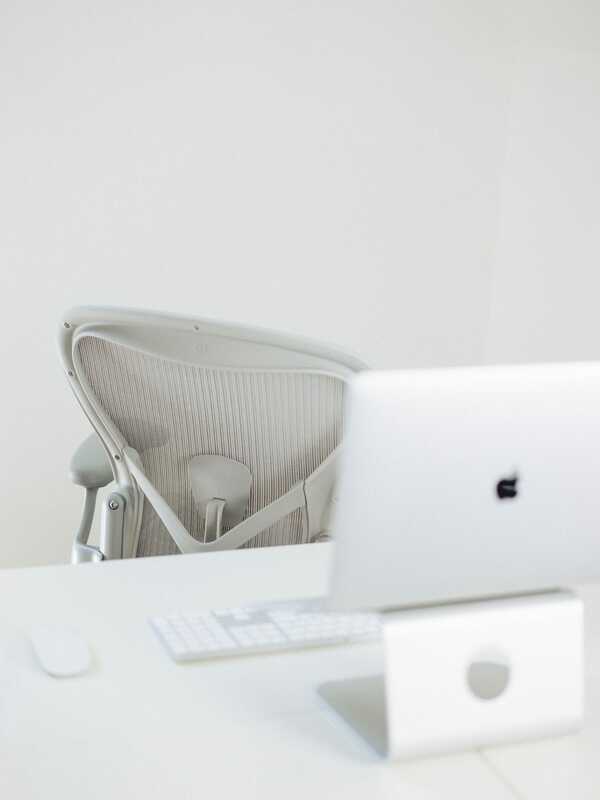 The Aeron’s frame can be made of glossy aluminum or brushed aluminum. Here, you can see the brushed aluminum Mineral frame. The frame of the chair can also be made from a range of materials depending on your customized options. My Aeron has a Mineral-colored aluminum (glossy or non-glossy) frame and chassis. Everything spins, moves, and adjusts with ease, like a well-oiled bicycle chain. The floor casters can also be customized. I have standard hard floor or carpet casters. The best part about these casters is that, although they are hard plastic, they don’t roll across a hard floor as though any tiny pebble will throw them off course. Instead, it almost feels like the casters are made of rubber. They’re also impressively quiet, ensuring you can roll across the floor and keep your infant son or daughter sleeping in the room beside you. There are no straight lines on the Aeron. Every curve is designed to naturally fit your body, ensuring comfort in every position (except when sitting cross-legged). 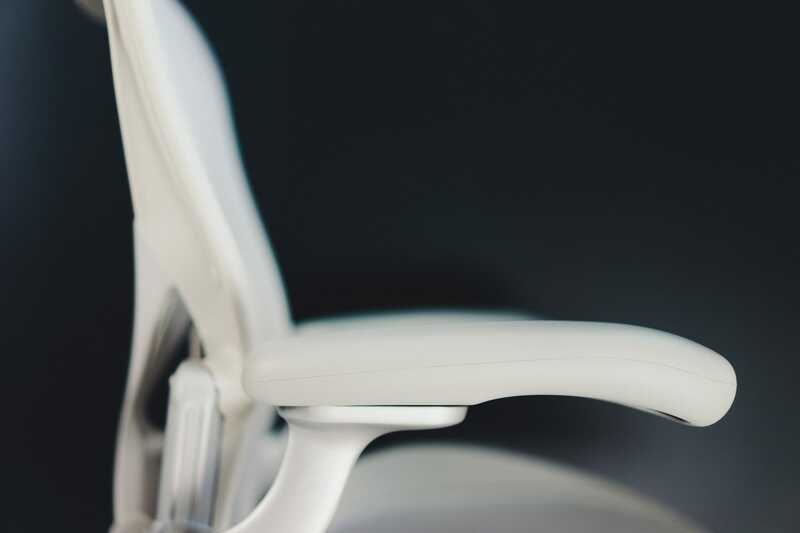 From the contoured lines flowing away from your shoulders down to the Mineral/Satin-colored aluminum frame, the Remastered Aeron is an engineering marvel. If you cast aside the idea that comfort can only come from cushions and leather, this woven membrane/hard plastic wonder can provide an ethereal level of comfort. As I said earlier, it seems to defy logic. An over-arching goal with the Aeron’s remastering in 2016 was to bring the design up to date with the latest materials. 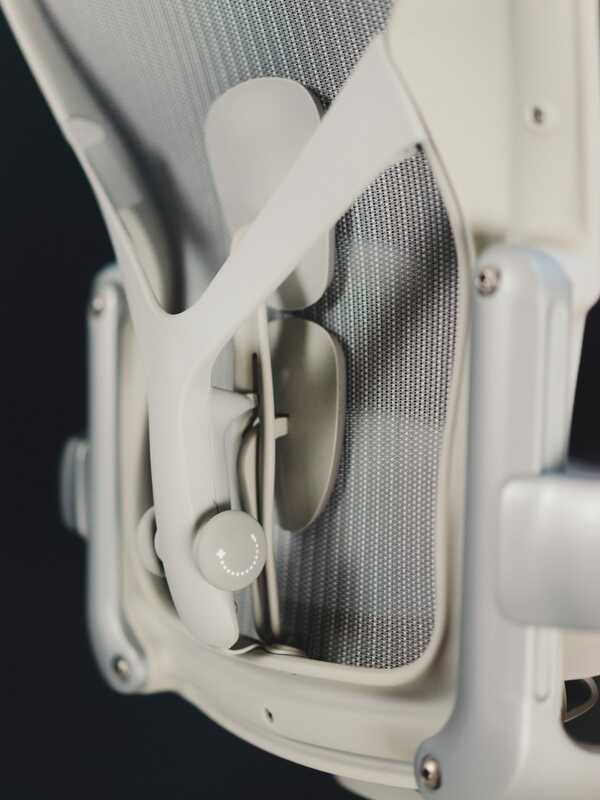 This means not only an improvement in the quality of materials, but also in an environmentally-friendly approach to the Aeron’s frame and build. The Aeron is made of 39 percent recycled content and 91 percent recyclable material – top marks for the environment. From the onset, the Herman Miller Aeron was designed with the environment in mind. Today, the trend continues. Chadwick ensured the Remastered Aeron was built with 39 percent recycled content and 91 percent recyclable material. 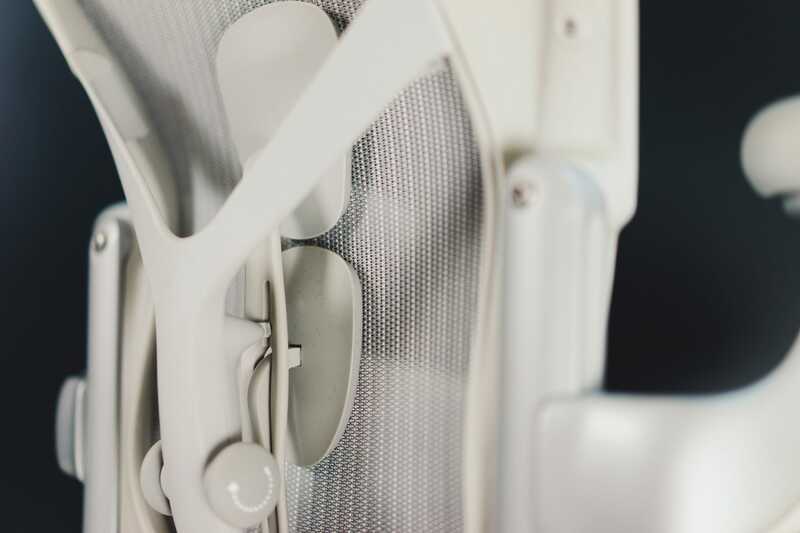 Back in 1994, these materials will have played no small part in the adoption of the Aeron chair in big cities and played right into the trends set in Silicon Valley. The same can be said today. The chair’s weight has also been reduced in favor of the environment. With the remastering, the Aeron has taken the environmentally-friendly approach a step further. Chadwick was able to reduce the weight of the chair by three pounds (although it’s still one heavy chair to move around) and achieved numerous green awards for the design. Herman Miller’s “environmentally friendly” design also passes the work environment test; you can be sure this chair will fit into any modern office anywhere in the world. 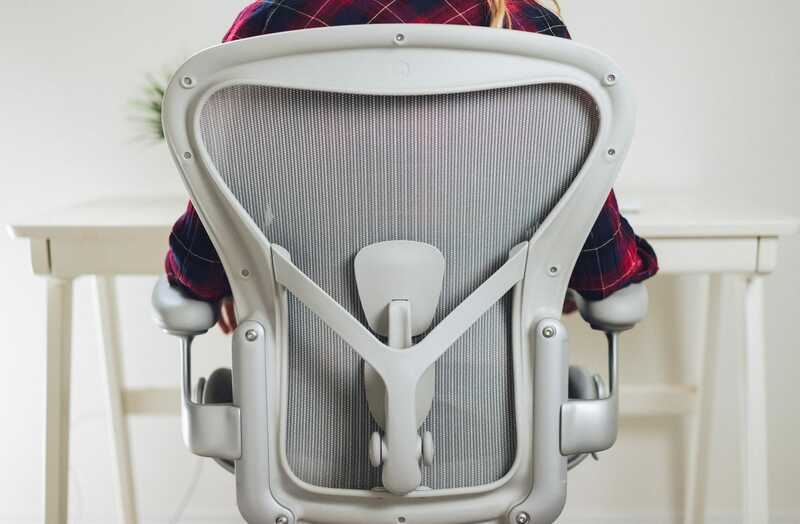 Herman Miller’s Aeron website showcases the Aeron’s environmental strengths in other areas as well — namely, in that the Aeron fits within a wide range of environments. Be it the office, the boardroom, or the home office, Chadwick ensured the materials used would fit in today’s work environments. 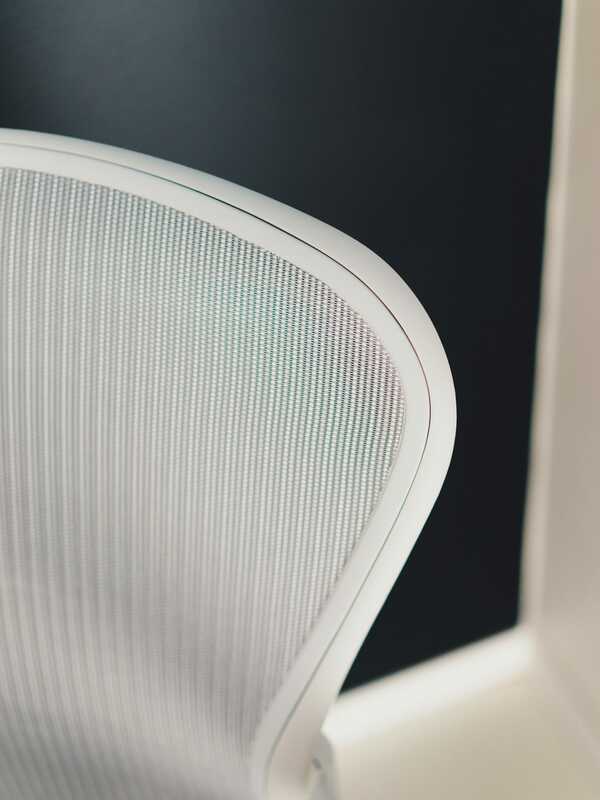 The woven pellicle flows into the hard plastic chair frame, while brushed aluminum meets rubberized plastics in the base frame. Glossy aluminum base frames can also be added to ensure it fits within your office decor style. Putting aluminum and hard plastic together does result in an audible chair. 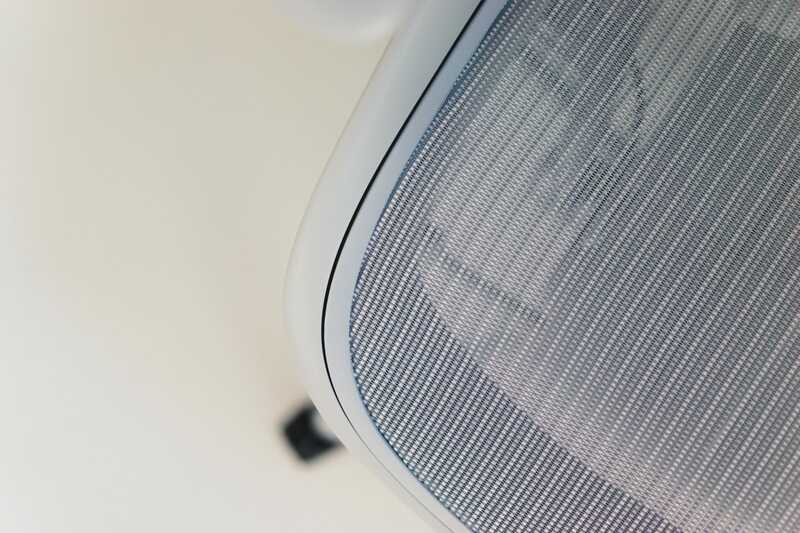 One of the major complaints of Herman Miller’s more expensive office chair, the Embody, is the amount of squeaks and shrieks the materials make when moving around. The Aeron isn’t entirely free of this complaint either. There are some squeaks when spinning around or in recline. I’d never be able to wake anyone up with the level of sound, but your co-workers will likely hear when you’ve sat down in your chair. The old Aeron certainly began to look long in the tooth, especially with the upholstered fabric and plain color schemes. The Remastered Aeron will fit in any environment you put it in, while treating the environment properly from the start. Why spend an inordinate amount of money on an office chair if it doesn’t deliver in the comfort department? Frankly, if the Aeron didn’t deliver comfort and ergonomic postures for the office environment, it wouldn’t have developed its cult-like fanbase. 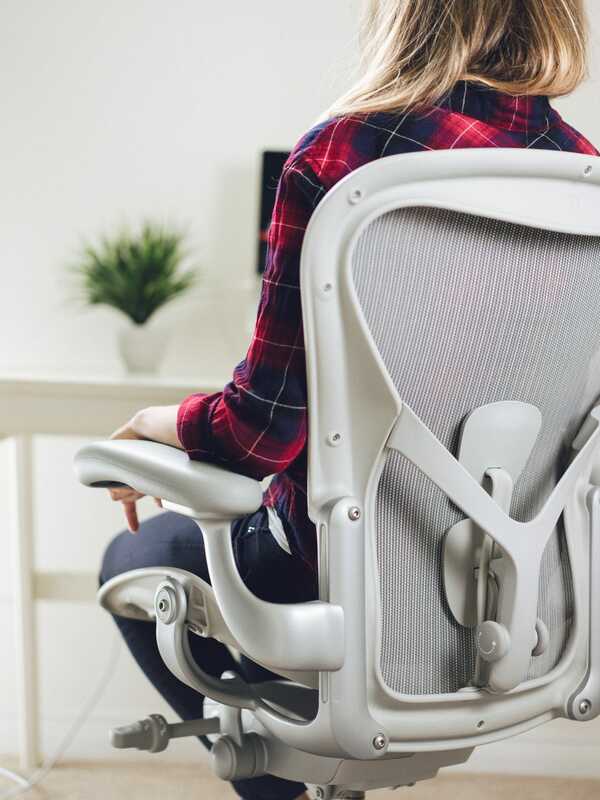 The Aeron delivers comfort and posture support in a few different ways. The pellicle (the part where you sit on and rest your shoulders against) has eight different woven tensions, ensuring comfort and support where you need it most. First, the woven pellicle is woven in eight different zones of tension. At different spots across your shoulders, back, and thighs, the woven fabric actually has varying degrees of tension. This delivers support where you need it and relaxation where you need it. The woven pellicle is not only comfortable, it’s breathable too. Air flows seamlessly through to keep your back cool on those hot summer days. How the woven fabric glides right into the hard plastic frame is beyond me. Everything about the woven pellicle is an engineering marvel. As touched on earlier, the woven pellicle allows body heat and air to flow through as though it wasn’t there. Needless to say, this keeps your body the proper temperature throughout the work day. The Remastered Aeron has an updated tilt function. Chadwick opted to use a new tilt mechanism over the old rubber spring. 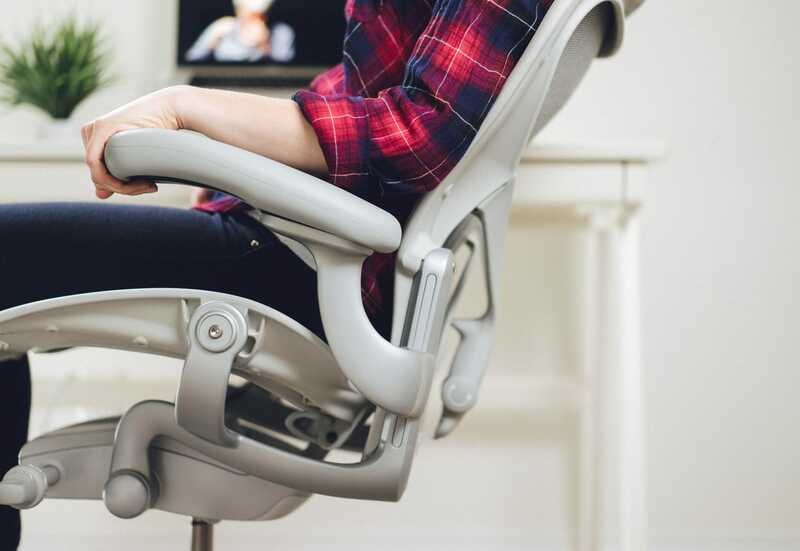 No matter the position of your recline, the Aeron is always perfectly balanced. If you are set to tip over, it’s because your body itself isn’t balanced. 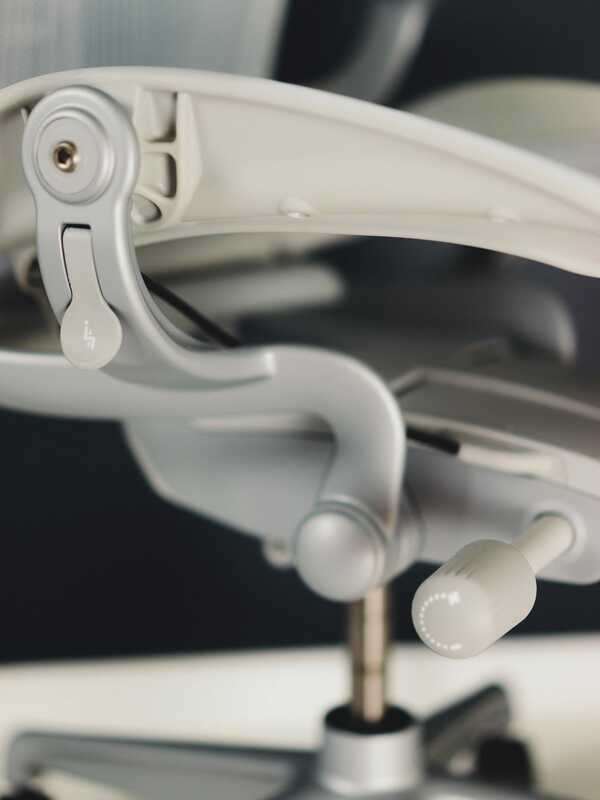 With the Aeron remastering, Chadwick revisited the Aeron’s tilt mechanism to ensure it continued to deliver proper support to your body when in recline. I’m sure the science behind the tilt mechanism update is beyond the scope of this review, but the mechanism delivers the smoothest chair recline I’ve ever experienced. There are a fair number of tilt mechanism customization options. I believe tilt limiter’s are essential for office chairs, but your mileage may vary. At any point in the recline, the Aeron feels as though it’s perfectly balanced. With other chairs, you have the option of leaning all the way back or being snapped back into an upright position. 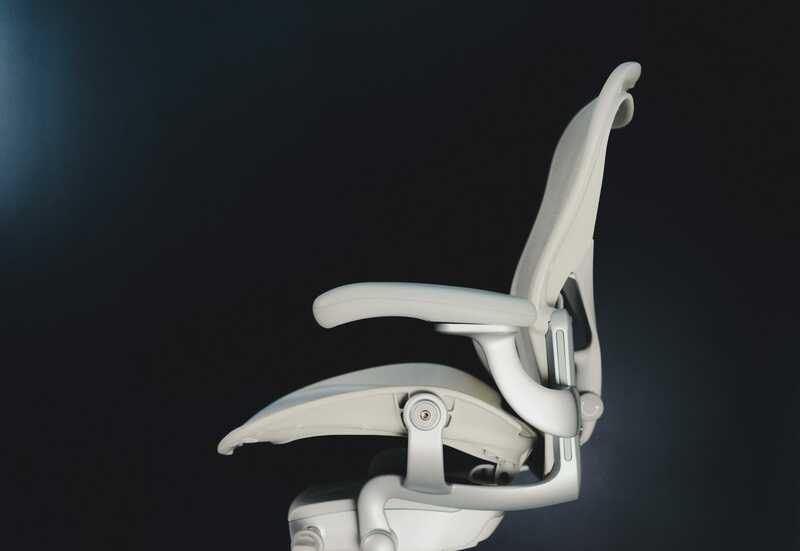 The Aeron finds a way to eliminate any volatility in the recline. 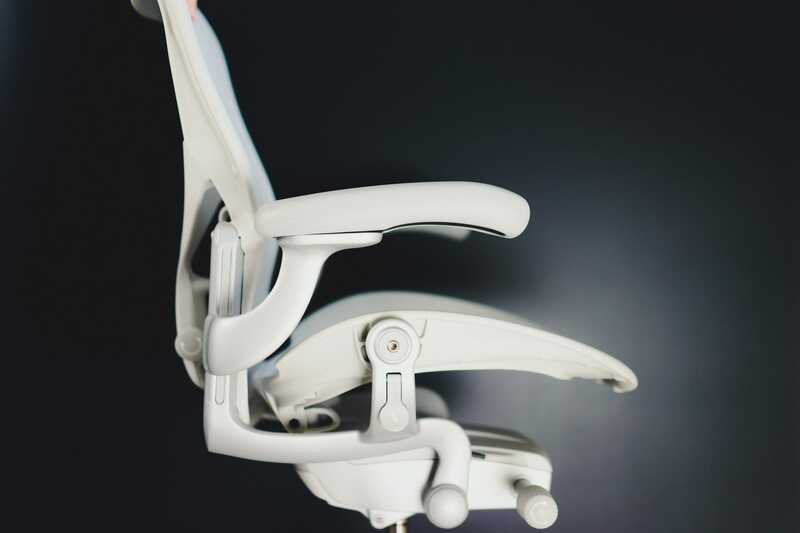 So, whether you’re leaned back and staring into the ceiling deep in thought, or your zoned in on the code on your computer screen, the Aeron’s tilt mechanism has your body balanced and on point. 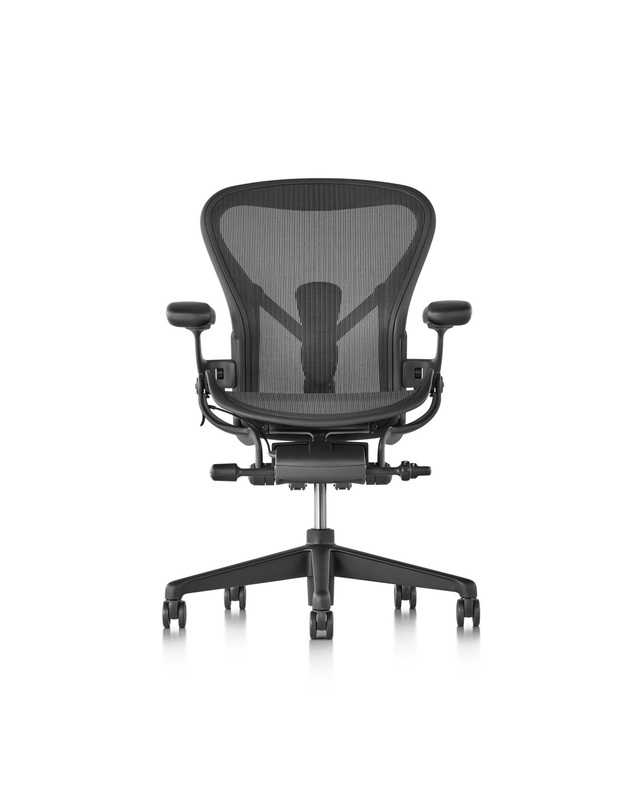 if there is one facet where the Aeron excels more than any other, it’s in lumbar support. Lumbar support is also of intense focus here. Herman Miller claims the updated PostureFit SL adjustable lumbar support helps give your spine the same shape as a standing position. I’m a little apprehensive to go so far as to say my body feels the same sitting in this chair as it does when I’m standing, but I certainly notice an improvement in the lumbar region over other office chairs. The PostureFit SL lumbar support mechanism is a customizable option, but it should be compulsory for potential buyers. The additional support for your lower back is an absolute must-have. No matter my posture in the Aeron, I can feel the PostureFit SL mechanism pushing my spine into a more comfortable position. But I’d never choose to sit if I had the option of standing instead. I regret not purchasing adjustable armrests. These armrests are stationary and don’t extend outwards as far as I’d like. The unadjustable armrests feel a tad pulled back. When I rest my arms on the armrest, I find my elbows nearing the end of the armrest and my wrist and hands dangling off the edge uncomfortably. I personally wish these armrests were pushed out further. The hard plastic frame of the chair is necessary for support and shape, but it makes other sitting positions uncomfortable. Every now and then, I like to sit with one leg crossed underneath the other. The hard plastic outer shell essentially eliminates the ability to sit cross-legged. While you could force the seating position, it’s incredibly uncomfortable to do so. One of the major selling features of Herman Miller’s Embody office chair is the height of the backrest. The Embody provides support right up your back to the base of your neck. The Aeron stops at the base of my shoulder blades, providing very little support to my upper shoulders and neck area. When seated forward, this has little impact. However, when in recline, I’d prefer to have more support for my neck so my muscles don’t have to carry the load. You can purchase after-market headrests for the Aeron, but that works against the purpose of the Aeron. Undoubtedly, this was a conscious decision, but it could have others looking at the Embody instead. I appreciate the ergonomic design of the way the bottom portion of the pellicle falls away from the chair. This increases blood flow to your feet and legs. However, I like to sit cross-legged on the chair from time to time, and the hard plastic outer frame makes this position extremely uncomfortable. These are relatively small complaints in the grand scheme of things. If you need more shoulder and neck support, the Herman Miller Embody might be a better choice. Aside from that, the Aeron meets every comfort standard I am personally aware of. My body feels at least 100 times more tired when sitting in a poor office chair than when I spend the day in the Aeron, and I don’t have as many instances during the day where I feel the need to stand up and walk around. Herman Miller has been selling this chair since 1994 with nearly an identical design throughout that time period. If there were durability issues, there would have been redesigns and improvements made at some point over the last 25 years. The quality of the materials leave little to worry about. All controls and dials spin and change with proper effort (too little effort and you worry about quality of parts; too much effort and you worry about breaking pieces). I haven’t even noticed a scratch in my six months of ownership. The Aeron is backed by a 12-year warranty. This warranty all but eliminates any major concern you may have with the chair’s durability and longevity. The Aeron’s frame is made of steel, aluminum, and hard plastic, while the knobs and dials all have a rubberized plastic outer material. There isn’t a single piece of this chair that feels cheap, so I’d be amazed if durability was an issue. That 12-year warranty is a telltale sign that Herman Miller stands by the design and life span of the Aeron. There should be little worry this chair can’t handle the rigours of everyday office life. Any discussion around the Aeron’s price must be prefaced by the reality of an everyday office job: You are going to spend at least eight hours in this chair everyday. There shouldn’t be a small price tag around your body’s health if you plan to sit all day. A second preface would be the plethora of customization options. Most importantly, this doesn’t include any lumbar support (important!) or tilt limiter functions (not as important). There are a ton of options there which can shoot the cost of this chair through the roof. 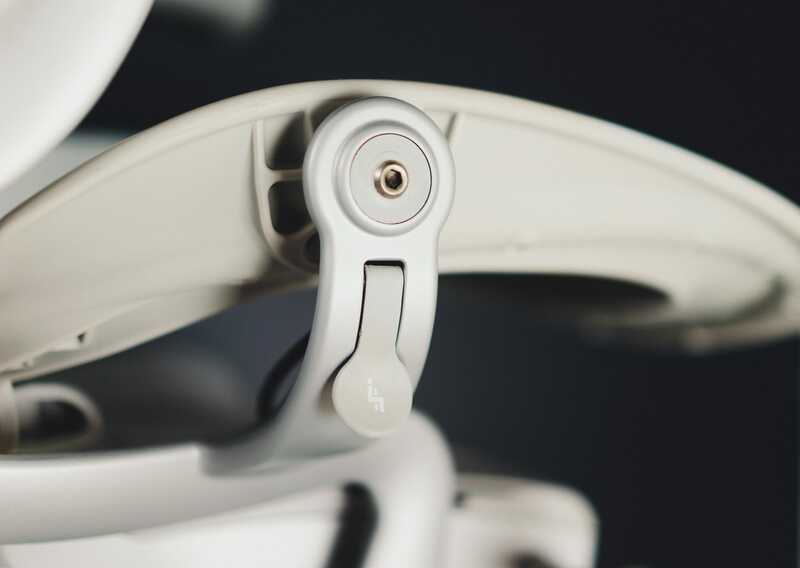 To me, the most important options are tilt limiters and PostureFit SL support. This chair, in the baseline graphite color, comes out to $931. You can even save a few more dollars by going with a less flashy tilt limiter. So, is the chair inexpensive? Not even maybe. Is it a fair price? At $750 to $1,000, it’s hard to not look at this chair as value for your money. It’s the most comfortable chair I’ve ever sat in, period. 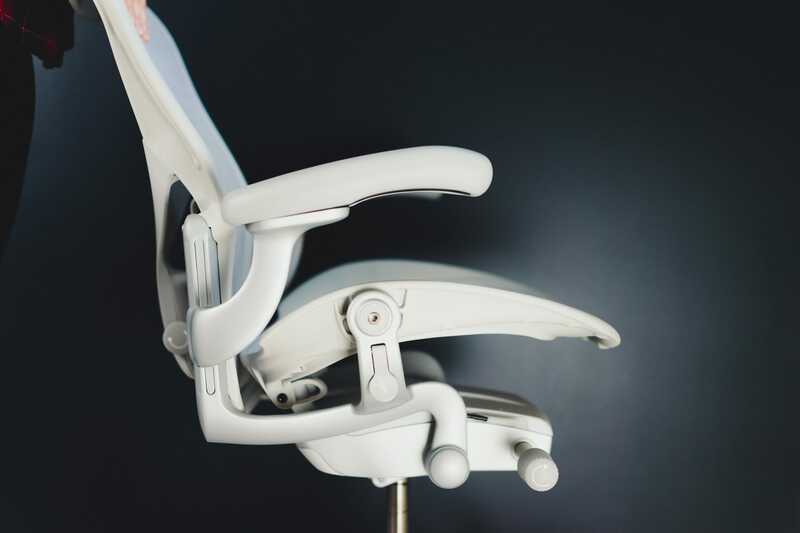 Considering the durability, the 12-year warranty, and the quality of the materials in play, $1,000 is more than warranted for a chair of this caliber. If you spend close to $1,000 on your mattress — which you also spend about 8 hours a day nestled in — spending $1,000 on an office chair shouldn’t be too difficult a decision. Plus, it has the potential to be the most healthy $1,000 you’ve ever spent. You can purchase the Aeron at a variety of retailers, including Amazon. Here is a link to a wide variety of the Aeron range — some of the models have PostureFit SL support, while others have other features. Be sure to read the description of the Aeron you’re looking at to ensure it has the features you’re looking for. 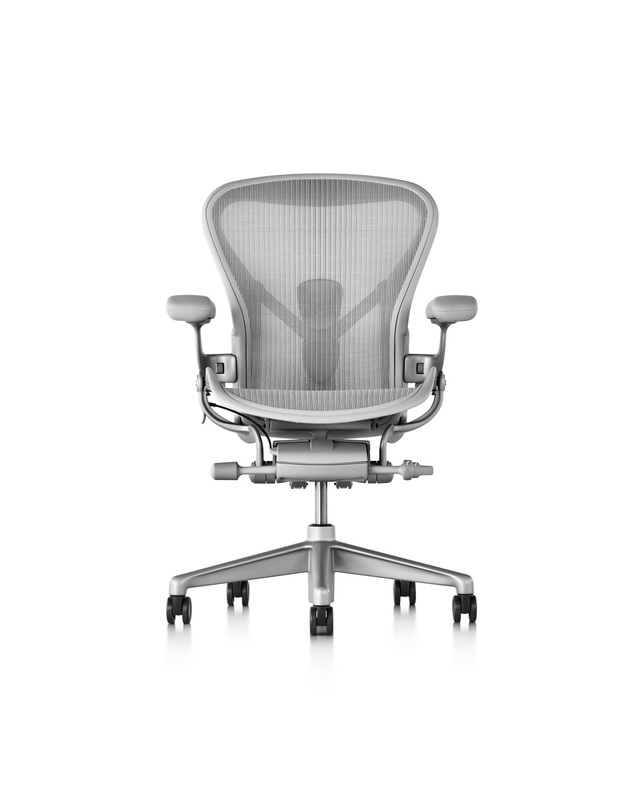 Of course, you can also purchase the Aeron on Herman Miller’s online store. 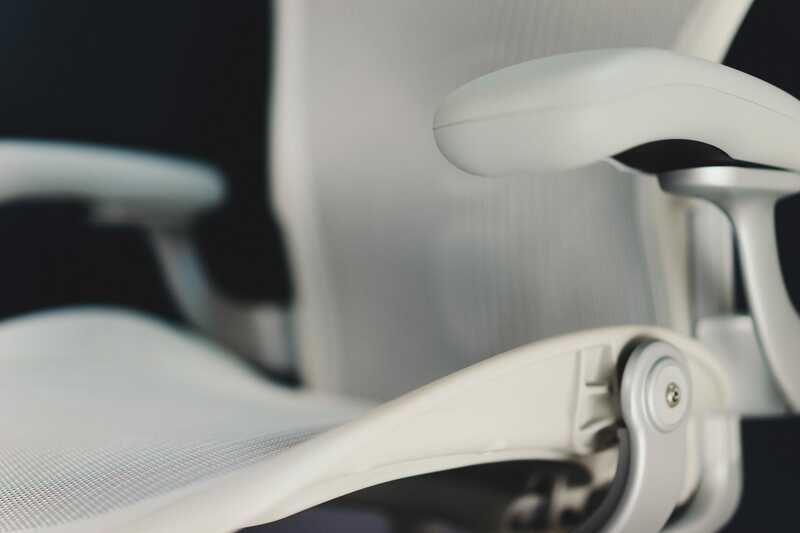 It’s an odd topic to be passionate about, but the Herman Miller Aeron has proven an office chair can bring out the best — and, probably, the worst — in us. 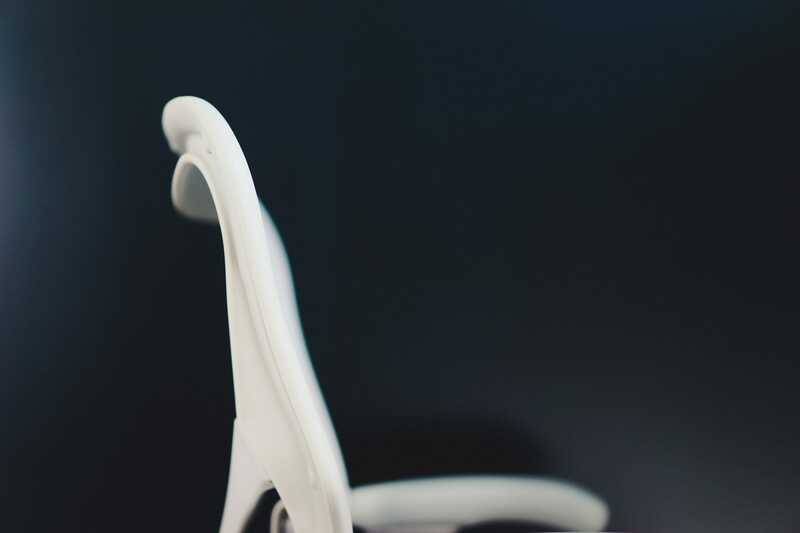 Since 1994, Aeron users have become devoted followers and fans, spreading the word of healthy office chair engineering across the globe. The Remastered Herman Miller Aeron was a little gift to myself last year. Little did I know it would be more so a gift for my body and my health. Thanks to the fanbase, the Aeron has become one of the world’s most popular office chairs. You can see the Aeron in Hollywood, in the financial offices in New York, and in the studios in Paris. And it’s not hard to figure out why. 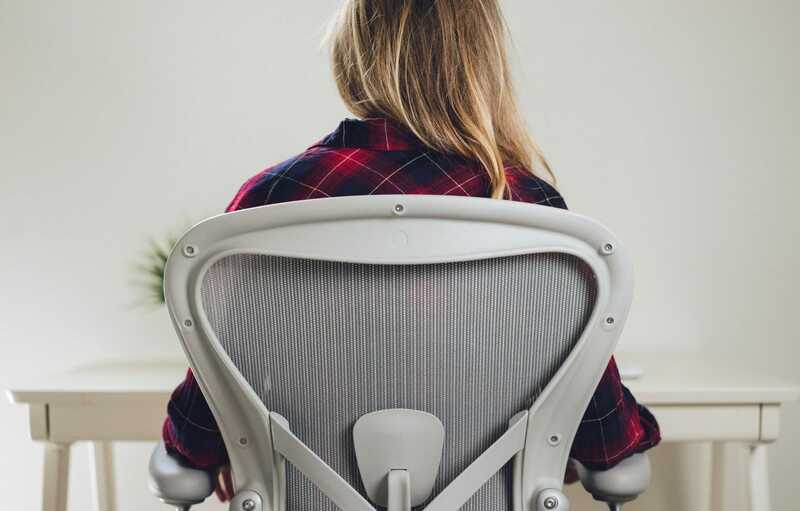 If you work in a chair for the majority of the day, or if you have a home office where you spend most of your time, a healthy chair is an increasing must-have. There’s a reason the Herman Miller Aeron is so popular. It should be at the top of any potential buyer’s list. The Remastered Aeron only improves upon the Aeron’s enduring legacy. With new colors, improved tilt functions, and a woven pellicle fit for a king or queen, it’s hard not to get too passionate about this myself. Save your body. Buy an Aeron. Your legs and back will thank you later.